On behalf of the International Stability Operations Association, I would like to thank you for being a member and for allowing me to serve as your Chairman for another year. I am truly honored and sincerely appreciate the confidence and the opportunity. I would like to recognize our ISOA President, Mr. Howie Lind for his outstanding service and support to ISOA during 2016. In a short period of time, he has helped to transform the association in a positive way as a result of his leadership, successful collaboration with members and supporting stakeholders while attempting to offer value to all of our members as a result of his experience, dedication, vision and action oriented work ethic. In addition, I would like to thank our current member companies, as well as the Board of Directors for the hard work, time and commitment you put into making ISOA a success as well as welcome all of our newest elected Board members and companies who have recently joined ISOA. We have an exciting year ahead and your ideas and contributions will be critical to our continued success as we transition into 2017. Finally, I would like to thank you for attending and participating in the 11th Annual ISOA Fall Summit. Thanks to you, the ISOA Summit was a resounding success-and featured an impressive line-up of distinguished speakers. The 11th Annual ISOA Fall Summit brought together a diverse and dynamic group of speakers and panelists that not only provided in-depth insight; but also actionable information on some of the more pressing issues which our members face in the contingency contracting space. The annual ISOA Summit provides a critical forum to discuss these issues and offers an important opportunity for the government and private sector to interface and collaborate with one another to refine our focus and improve our contracting solutions. ISOA would like to offer special gratitude to all of our speakers, panelists, and moderators for helping to facilitate the open dialogue and close collaboration that our association strives to achieve between government and private industry. We would like to thank all of the sponsor organizations for their continued support and for helping make the summit a success. It is because of your close participation that we are able to be such an impactful organization, so thank you very much for your time and resources in supporting this summit. In particular special thanks to our keynote speakers and accomplished panelists from the U.S. Department of State including: Mr. Gregory Starr, Assistant Secretary of State for Diplomatic Security, and Ms. Cathy Read, Director, Acquisition Management, as well as from the U.S. Department of Defense, including: General John F. Kelly, USMC (ret.) and Mr. Gary Motsek, Deputy Assistant Secretary of Defense, Program Support. Your presence helped to make this event a great success, and your enthusiasm and positive spirit helped make our time together both productive and fun. We hope that you continue to be engaged with the International Stability Operations Association and partake in upcoming events that we have planned. Moving into 2017 ISOA will continue to host important events, engage with policy-makers and key government agencies at all levels on issues that affect the industry every day as well as work with our committees and working groups to facilitate necessary dialogue among the association and those it represents, as well as among other member organizations internationally. Stay tuned for updates on upcoming ISOA events! Join us for our next Human Rights & Business Roundtable meeting which will take place on Thursday, December 8. Commercial sites the world over rely on private security companies to protect their people, property, and production. However, when private security comes into contact with communities, there can be a real risk of tensions, conflict escalation, and at worse, human rights abuses. It is therefore imperative that clients ensure that their private security personnel are properly vetted, well-trained, supervised, and most importantly, operate to international standards. The Voluntary Principles on Security & Human Rights made progress in setting forth requirements for oil, gas, and mining companies to ensure that their private security providers meet these standards. Building upon this, the International Code of Conduct embodies a widely accepted set of principles for responsible security provision which have been operationalized in national and international management system standards. This Roundtable will consider how clients can exert leverage through requiring specific standards of their private security providers, and whether those providers can in turn benefit from standards implementation and certification as a qualifier and market differentiator. 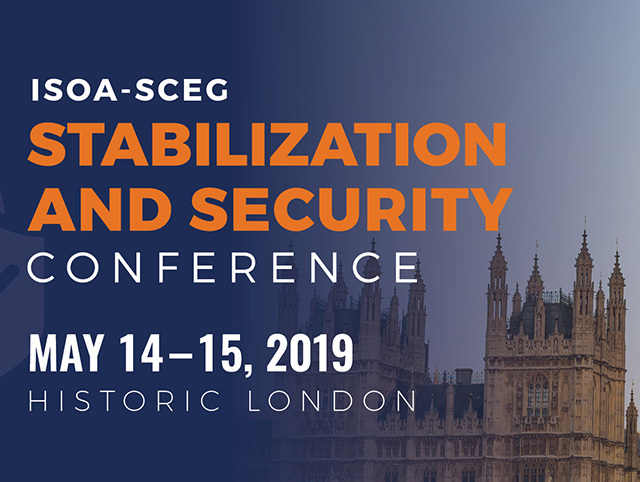 The Roundtable will bring together perspectives from both the client and provider on how, collectively, standards in the private security sector can be raised. John Mosher - Vice President - Global Security, Freeport-McMoRan, Inc. Please note that attendance at the Roundtable is by invitation only. If you are interested in joining the Roundtable, please contact Christina Murphy. The United States Kurdistan Business Council (USKBC) is a 501(c) (6), non-profit trade association based in Washington, DC. The organization is dedicated to facilitating trade and commerce for U.S. companies in the Kurdistan Region of Iraq and to strengthen ties between the private sector in the U.S. and Kurdistan Region of Iraq. The USKBC was recently founded by several prominent U.S. companies across a variety of industry sectors. From energy to manufacturing, to agriculture, financial services and transportation, the USKBC believes promoting stronger ties between the U.S. and Kurdistan is important to the stability of Iraq and the region. The USKBC seeks to highlight the unique opportunities for companies to invest in Kurdistan and to make it easier for companies to secure their investments and be successful. The just released Clements Worldwide Risk Index Summer/ Fall 2016 Edition, which surveyed over 400 organizations operating in every region, including government contractors and security organizations, found that the highest sources of loss for international companies were business interruption, property damage and general liability. Will you participate in the next survey so that organizations like you can compare greatest risks with peers to hopefully better protect staff and assets abroad? The survey only takes ten minutes and can be completed here: http://confirmit.ssisurveys.com/wix/p66033244.aspx?SS=1&loc=1. Thanks for your participation. If you would like to access the results of the Summer/ Fall 2016 edition or listen to a webinar for Government Contractors and Agencies regarding the results visit https://www.clements.com/lp/risk-index-2016. The Clements Worldwide Risk Index is produced by ISOA member, Clements Worldwide. Darryle Conway, vice president of business development for global logistics and stability operations business unit at PAE, has joined the International Stability Operations Association's board of directors. ISOA is a partnership of nongovernmental organizations and private sector and provides assistance to members through partnerships, business development efforts and advancement of regulations that seek to facilitate service delivery in fragile environments. Constellis, a leading, global provider of risk management and operational support services, announced today that the company has earned the 2017 Military Friendly Employer designation conferred by Victory Media. The list of Military Friendly employers recognizes companies with the best job opportunities, hiring practices, and retention programs for transitioning service members and spouses seeking civilian employment. Headquartered in Reston, Va., Constellis employs more than 8,000 personnel worldwide, of whom half are military or law enforcement veterans. The company provides opportunities for top-performing military veterans with experience in physical security, special operations, law enforcement, emergency medicine, program management, federal programs, training and advisory, logistics and supply chain management, and more. David B. Kurzweil, shareholder, co-chair of the Financial Institutions Practice at international law firm Greenberg Traurig, LLP, and chair of the Atlanta Restructuring & Bankruptcy Practice, has been named to the Commercial Finance Association's (CFA) 2017 Executive Committee. The CFA announced their new Executive and Management Committees for its Fiscal Year 2017, which began Oct. 1. The Committees are comprised of key leaders in the commercial finance industry and will guide the Association, make policy decisions, confirm new members, and provide advocacy, education, and thought leadership for the industry. Kurzweil will serve as a member of the 2017 Executive Committee and as Chair of the CFA Education Committee. With more than 29 years of experience, he has represented corporations, partnerships, individuals, and financial institutions, providing innovative solutions to clients across a wide range of industries, including energy, technology, manufacturing, retail, cable television, publishing, real estate, transportation, and professional corporations. He has wide-ranging experience in Chapter 11 Bankruptcy cases, representing financial institutions, debtors, creditor's committees, and trustees. In addition, he frequently represents financial institutions and companies in out-of-court debt restructurings. Kurzweil also represents financial institutions in all types of financing, including asset-based loans and debtor-in-possession financing transactions. Continuing its strategic growth in Northern California, the international law firm Greenberg Traurig, LLP has added Maria Sendra as a shareholder in its Silicon Valley office. Joining the firm's Corporate & Securities Practice, Sendra is the latest addition in a stream of local hires over the past year. Sendra has wide-ranging experience advising clients on venture capital and private equity transactions, strategic alliances, joint ventures and public offerings. She regularly assists clients in a variety of industries on all areas of SEC compliance, corporate governance and mergers and acquisitions, including numerous cross-border transactions involving Latin America, Asia and Europe. A fresh Research and Markets report suggests a growing demand for data in commercial applications will help buoy the global unmanned aerial vehicle market to reach $21.23 billion by 2022 from $5.97 billion in 2016. The report predicts the global drone market will grow at a compound annual growth rate of 20 percent from 2016 through 2022, spurred by data demand and anti-terrorism campaigns across the world, Research and Markets. Remote Medical International (RMI) is proud to announce a new scholarship program designed to provide active military and veterans with the continued ability to help others through acquiring the skills to act as a Remote Emergency Medical Technician (REMT) or Advanced Emergency Medical Technician (AEMT). A global leader in the provision of remote and tactical medical training and support services, Remote Medical has trained and certified over 17,000 students from all branches of the US military, law enforcement, FBI, Border Patrol, and other government, not-for-profit, and commercial organizations. The State Department has approved Qatar's request to buy 72 Boeing (NYSE: BA) F-15 aircraft, weapons, related support, equipment and training services under a potential $21.1 billion foreign military sales agreement. The Defense Security Cooperation Agency said the agreement aims to support political stability and economic growth in the Persian Gulf region, as well as support Qatar's defense against current and future air-to-air and air-to-ground threats. NCI Inc. has won an 18-month task order by the U.S. Army Information Systems Engineering Command, National Capital Region Engineering Directorate, under NCI's TEIS III contract. Valued at $10 million, the company will provide engineering and integration support services for the U.S. Army Intelligence and Security Command at Fort Meade, Maryland. Under the task order, NCI will engineer, furnish, install, secure and test INSCOM command, control, communications, computers and intelligence/information technology systems. The work will encompass multiple classification levels for data network systems, voice systems, applications, audio/visual systems, supporting applications, physical end user locations and classification connectivity requirements, infrastructure equipment room and premise distribution wiring within a sensitive compartmented information facility. The Obama administration has formally requested $11.6 billion in extra wartime funding; bringing the total fiscal year 2017 overseas contingency operations (OCO) funding request to $85.3 billion. The extra money comes in the form of two $5.8 billion budget amendment requests. The first is for DoD funds to the support the Afghan National Defense and Security Forces and to help in the ongoing campaign against the Islamic State group, commonly known as ISIS or ISIL, in both Syria and Iraq. The second funnels funds through the State Department and USAID for assistance in the non-military aspects of the counter-ISIL campaign. President Obama has ordered the Pentagon to find and kill the leaders of an al-Qaeda-linked group in Syria that the administration had largely ignored until now and that has been at the vanguard of the fight against the Syrian government. The move underlines the extent to which Obama has come to prioritize the counterterrorism mission in Syria over efforts to pressure President Bashar al-Assad to step aside, as al-Nusra is among the most effective forces battling the Syrian government. Two U.S. service members and two American contractors were killed by a suicide bomber on Afghanistan's Bagram Airfield. Sixteen American troops and one Polish soldier were wounded in the blast. The attack was carried out by "an apparent suicide bomber," Defense Secretary Ash Carter said in a written response to the incident. The attack took place around 5:30 a.m. local time. The explosion struck as military personnel and others were gathering for a "fun run" organized in conjunction with Veterans Day, a detail that is certain to raise questions about the Americans' security posture at one of the few remaining U.S. installations in Afghanistan. Layers of hastily erected barricades built from rubble and twisted metal trace Mosul's eastern front line where Iraqi forces and Islamic State group fighters are facing off in the dense neighborhoods and narrow alleyways of the country's second largest city. As the operation to retake Mosul enters its second month, Iraqi forces are preparing for prolonged, grueling urban combat. They have slowed the tempo of their operations, advancing just a few hundred meters at a time. Iraqi forces have gathered troops many times the estimated 5,000 IS fighters in the city. President-elect Donald J. Trump said that he was likely to abandon the American effort to support "moderate" opposition groups in Syria who are battling the government of President Bashar al-Assad, saying "we have no idea who these people are." In an interview with The Wall Street Journal that dealt largely with economic issues, including his willingness to retain parts of the Affordable Care Act, he repeated a position he took often during his campaign: that the United States should focus on defeating the Islamic State, and find common ground with the Syrians and their Russian backers.